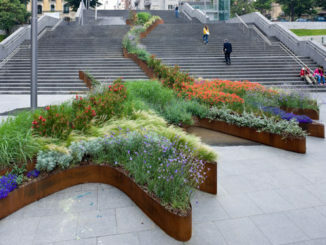 Systems theory has been an important method of thought in order to design landscapes in a sustainable manner. In our world today, humans are the leading influence on all systems; therefore, human impact is an integral part in how a sustainable system is conceived. Systems design is larger than the physical realm; it is the design of how our society acts, which reinforces how we think. 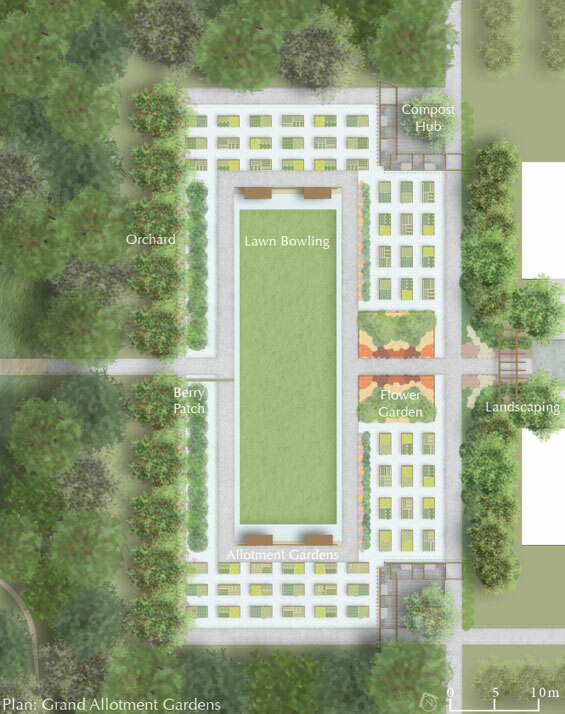 As landscape architects, we have the opportunity to design new human activities within the landscape that become habit, a part of culture, and influence systems. 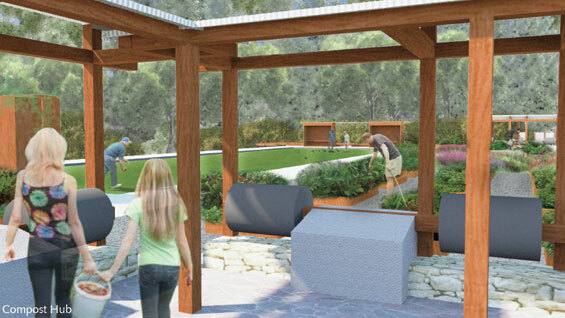 The design concept for this project is a closed loop system, in which the recycling of organic waste into the landscape is an efficient customary practice integrated into everyday human activities. The design of this project is strictly one of utility and efficiency to accommodate humans in recycling organic waste on a routine basis. Designing for new habits of recycling will ultimately help to change society’s beliefs about the value of organic waste and its usefulness. 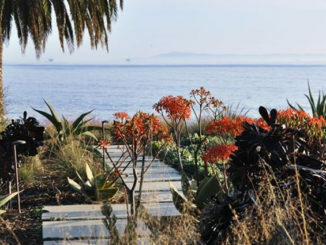 Landscape is often designed for awe, inspiration and beauty, which can be expensive and often difficult to maintain. This project is in contrast with that ideology and is intended to be ordinary, in order to assimilate with the mundane activities of everyday life. It is an exercise in habit, ritual, modesty and practicality. The design is intentionally simplistic and economical, and therefore, more available to a multitude of people. 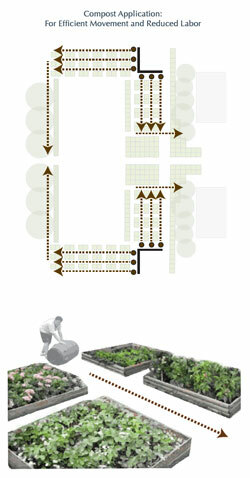 The design is a tool to be replicated for any location that has a missing gap between food waste and food production. 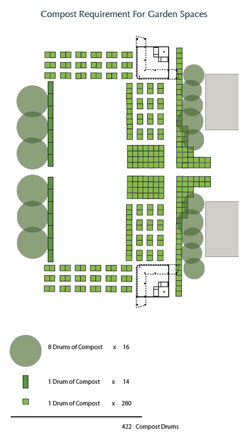 A decentralized series of composting systems, or “compost hubs”, are integrated into a park adjacent to a residential neighborhood. In a community effort, residents take responsibility for their organic waste and turn it into a beneficial resource: compost. The compost is used as fertilizer for a community garden, an orchard, berry bushes, and flower gardens. The compost hub accommodates current trends, in which people already desire to grow their own food to live a healthier lifestyle. Soil, which is typically sourced elsewhere for gardens, is generated on site by composting kitchen scraps, yards waste, and other organic biodegradable wastes produced by local residents. The composting method, the commercial drum, creates an aerobic environment that accelerates the composting process with minimal smell. Depending on environmental conditions, this method can turn waste into compost in about two weeks. 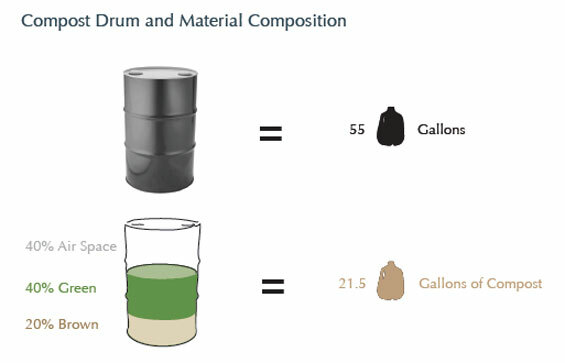 The quantity of drums within the park is designed to fit the weekly average amount of waste produced by the residents located adjacent to the site. The project estimates a person produces one gallon of waste per week. The compost system builds the soil’s quality over time, and the size of a drum is a measuring device in which to apply compost to the landscape. Gardens are sized appropriately to a drum’s compost output. This project is only successful due to its close proximity and ease of accessibility. 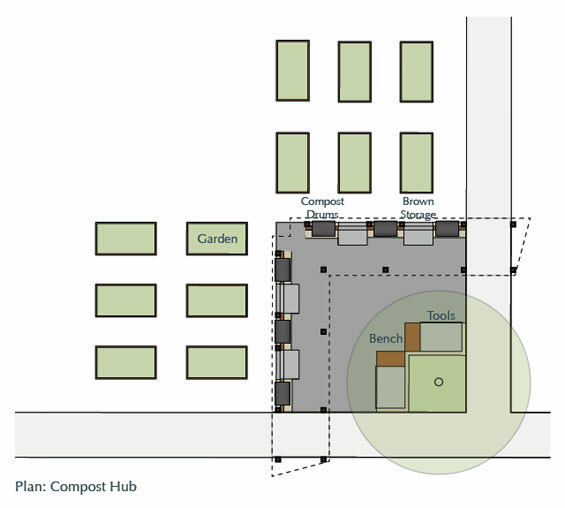 Compost hubs are located at circulation intersections. In a typical scenario, residents drop off of their waste on a weekly basis while on their way to a hike, walking their dog, checking in on the garden, or playing a game of lawn bowling. The proper mixture of green and brown waste materials is placed within the drums, and through coordination and community effort, are turned in their stands every other day to achieve the desired outcome. The garden’s form is dictated by compost distribution. 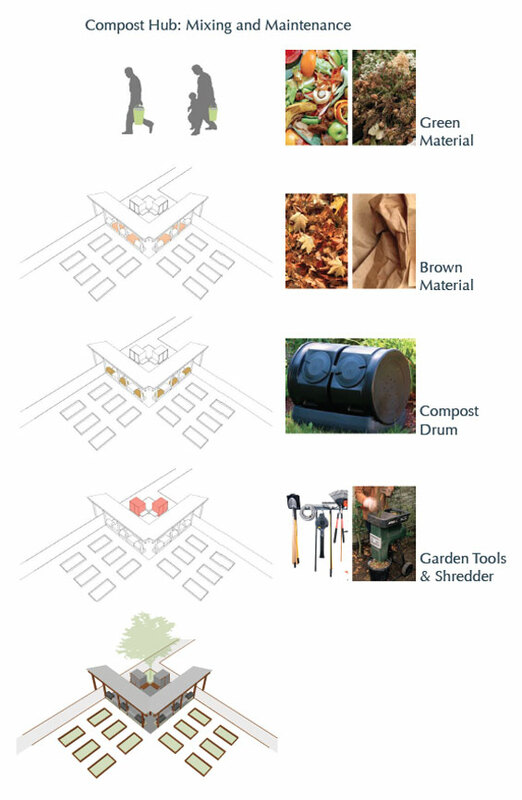 Waste maintenance and compost distribution are designed as orderly processes and the garden’s aesthetics are derived from this strict order. Residents take an active part in distributing compost, without heavy lifting. The active participation of waste recycling helps residents grasp the amount of waste they produce, as well as realize their key roll in continuing the process of nutrient recycling. Only through the small efforts of the everyday person, will society be able to make larger changes as a whole. Closing the loops in systems requires the effort of an entire culture. The urban agriculture movement already is an indicator that our culture has been taking steps towards a greater stewardship of the land, even without the aid of landscape architects. This project is simply a strategic method in which to assist people in their efforts to grow produce, and help them attain a sustaining lifestyle.